Place the coconut sugar, water and lemon juice in a small saucepan and bring to a gentle boil over a medium heat. Gradually add the coconut milk to this, stirring well each time. Then add the vanilla and a pinch of salt. Simmer for approx. 15 minutes or until the liquid has thickened and darkened in colour. Allow this to come to room temperature before storing in an airtight container in the fridge. If time permits, it’s best to make the sauce the day before for the tastiest results. Combine the eggs, milk and syrup in a small bowl and whisk with a fork before adding the flour and mixing well. Heat a little butter in a frypan over medium to low heat, and add approx. ⅓ cup of mixture per pancake. Cook for 2 minutes each side. 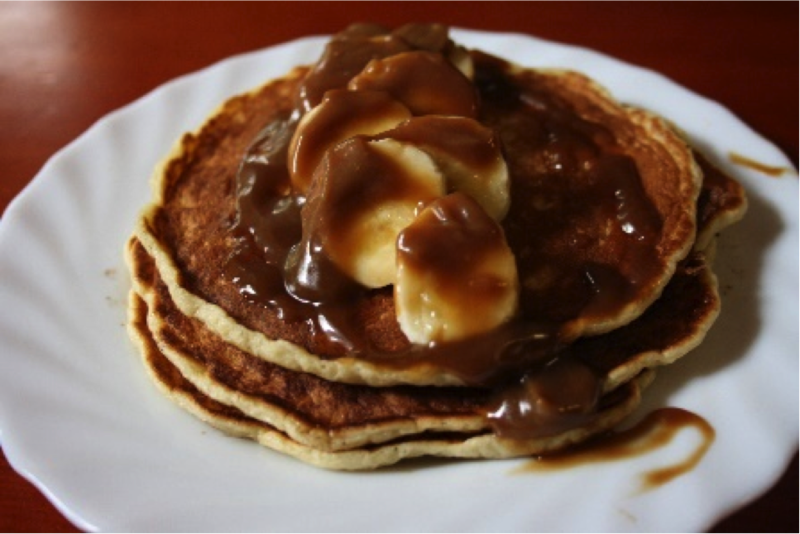 Serve with sliced banana and or fresh berries, and a drizzle of caramel sauce of course. Great Father’s Day treat. Or any day. *You can use a milk of your choice here. I choose to use almond milk.